I love my kitchen sink. I just love it. 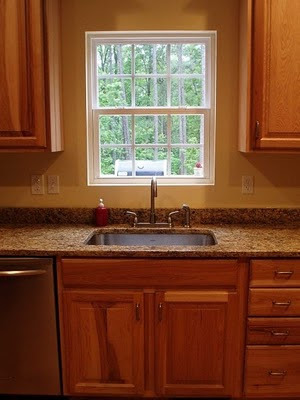 When we lived in the apartment, one of the things I hated most was the shallow double sink. Nothing fit inside it. Big cookie sheets were such a pain to clean that I often washed them in the bathtub. Soaking casserole dishes had to sit on the countertop. And since the garbage disposal sat at the bottom of only ONE of the two sinks, any food scraps that fell into the wrong side had to be scooped out with my fingers over the divide. Yuck. I hated that sink. And I swore to myself that I would NOT live with a sink like that any longer than I possibly had to. And then we started building our house. And I searched high and low for the biggest, deepest, stainless steel sink I could find. It was perfect. In fact, it's so deep that I can throw a mountain of dishes in and conceal them immediately! But don't worry about me. I can wash those up. Anyway, since I love my sink so very, very much, I try to scrub it out at least a couple times a year week. And I've found that the best thing for this is Bar Keepers Friend. It's an abrasive cleaner with a soaping agent and it works wonders. It easily cleans residue off my sink and gets rid of water spots. And I use it for other things, too. We've got some steel knives that are absolutely wonderful but tend to rust and discolor fairly quickly. No problem! 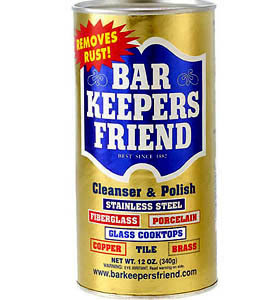 Bar Keepers Friend. Our stainless steel pots and pans lose any baked-on mess in a FLASH if I scrub them with this stuff. Of course, you wouldn't use it on something that you'd want to polish, because it's abrasive. But for those messes that you want to blast away, this stuff is your friend. Even if you're not a barkeeper.